The Red-Handled Children's Cutlery Aids Grip. 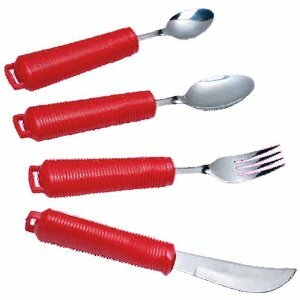 The Red Handled cutlery range is designed for younger people with reduced grip strength or reduced mobility in their hands. Specially designed cutlery for disabled children, Red Handled cutlery has an easy grip handle that is brightly coloured to also make it useful to people with visual impairments. Each utensil has a handle made from lightweight rubber that is durable and dishwasher proof. It can be bent to any angle and can reduce the strain placed on the hands and wrists making it ideal for arthritis sufferers.